After 12 months of planning, three flights on increasing smaller planes myself and four friends who have travelled around the world together found ourselves deep in the Bolivian Amazon jungle. Flying two hours over the Rainforest in a single prop plane and touching down on a landing strip cut out of the rainforest had been a humbling experience the scale and remoteness was difficult to comprehend. 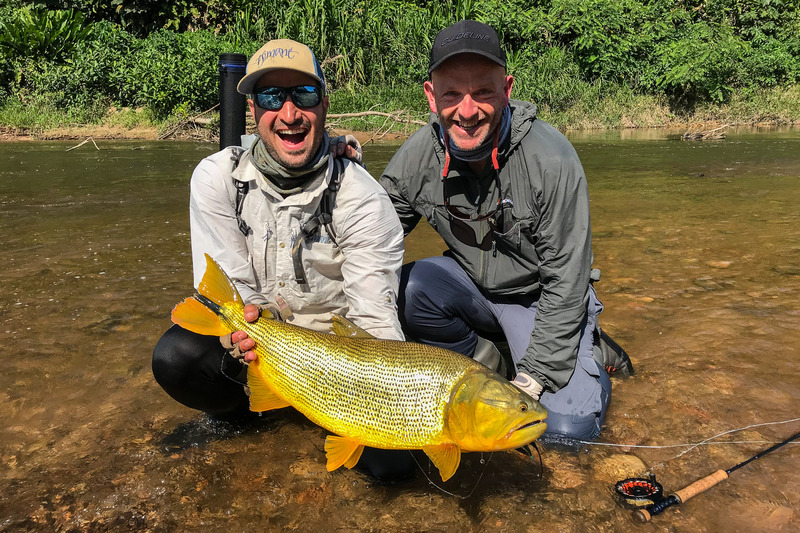 Followed by a boat ride for two hours in a dugout canoe we had arrived at Aqua Negra one of the three camps at Tsimane part of the Untamed Angling companies stable of lodges in Bolivia and Brazil. Words by Jim Curry, Guideline Sales Rep UK & Ireland. It had started by watching a film Tsimane 3X on facebook. I still remember the hairs on the back of my neck standing up as I watched huge Golden Dorado chasing flies and hammering into bait fish in crystal clear water. It looked immense and two hours later and a call to the guys we were booked on! Now we were here, sat on a hill overlooking the Secure river drinking a cold beer getting the briefing from lodge manager and head guide Ezequiel on what the week would look like. Kit assembled over more cold beers and further sensory overload as we watched the sun set over the rainforest and a sleepless night ensued. The plan was to take advantage of the remote camps high up the Aqua Negra a tributary of the Secure. So the following day in small dug out canoes we set off up river, the plan being to move quickly to the camp, fishing only when we saw “frenzies” the time when the Golden Dorado gang up and hammer into the shoals of Sabalo, the diet of the Golden Dorado. Frenzies erupt quickly and finish abruptly. Water sprays everywhere as the Sabalo driven into shallow water by the marauding Doarado. You have to move quick deliver the big streamer pattern on the nose of the fish stripping long and fast moving the fly away at pace. If the fish gods are smiling then an earth shattering take happens. Strip set and again and again and then you are attached to fish that pull harder run faster than anything I had previously experienced. As a result our first day was one of shock and awe. We had chances took one or two and blew many. The following days saw us pushing further upstream where the river shrunk but the fish kept getting bigger. Now it was all about sight fishing, stalking and hunting these incredible predators in the gin clear water. Everything was being pushed to the limit our skills our kit our nerves. All the GL kit we took held firm our skills and nerves at times did not. Until I found myself faced with a huge Dorado holding station in a shallow tail surrounded by sunken trees. Armed with the NT8 10´ #7, the Fario LW 68 fly reel and mouse pattern and my heart pounding out of my chest I took the shot. The mouse touched down and the huge fish swung up and inhaled the fly off the surface. Once hooked I knew that stopping fish from finding the logs was everything so I clamped down and hung on steering the fish away from danger, forcing the NT8 into an alarming bend, so much so I remember turning my head away as I felt the rod had to blow. Just as I felt I was getting the fish into a part of the pool where I had a chance, it dove into another sunken tree and the line went solid. Without hesitation Ezequiel dove full length into the river swam out to where my line had become entangled in the log. With the fish still attached he managed to free the fly line. Just as it snapped! Everything went slack and my heart sunk. Then a second later a shout from Ezequeil swiming back towards me he still had hold of half the line with an large angry fish attached to the other end. I pulled him out and between us somehow minutes later with line wrapped my hand running up and down the bank Ezequeil tailed the fish, 9kg of sheer perfection sighted, staked and taken off the surface. So happy that the Guideline kit stood up to what has to be the ultimate test, the hardware was flawless and the clothing and Alta packs where put through the paces and came through with flying colours. Every night at camp we swapped stories of the day. The incredible jungle, the beautiful river the indigenous guides who we watched hunt so skillfully with bow and arrow. Everyday was such an adventure undoubtably the greatest one of our lives. So hard relay in pictures and words. I have been incredibly blessed to have visited some of the worlds greatest fly fisheries and I went to the jungle looking for another adventure. We all of us as a group found deep in the Bolivian Jungle was so much more than we could have imagined. Massive thanks to all the team at Untamed Anglers and of course to our guides Ezequeil, Miguel and Luciano who never stopped working for us and were all great company. The greatest trip of my life? For sure until I return that is and remember – It’s all about the experience. Below you find a full gallery of images from the trip. Click/tap the first image and them click/swipe through the gallery.